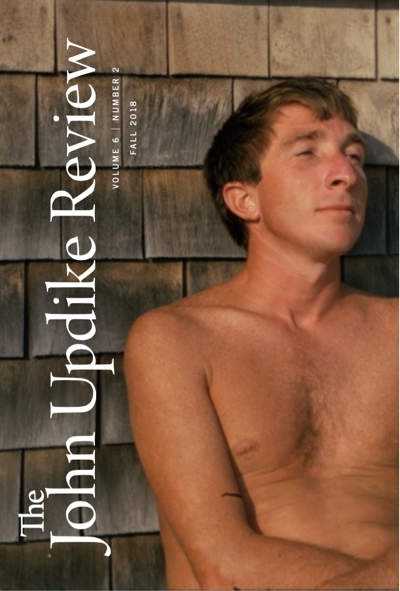 Members of The John Updike Society should be receiving a copy of the latest issue of The John Updike Review in their mailboxes. And it will be hard to miss. Mr. Updike appears shirtless on the cover of Vol. 6 No. 2 (Fall 2018) in a color family photo taken by either David Updike or Mary Updike Weatherall circa 1966-67. The contents are striking too. In the innovative ongoing feature “Three Writers on . . .,” this issue’s topic is “At War with My Skin,” with Updike’s essay reprinted, accompanied by essays from David Hicks (“It pains me to write these pages”: Updike and the Art of Self-Scrutiny”), James Seitz (“An Intimate Rankness: Updike and the High Art of Description”), and Elizabeth Hornsey (“Genetic Terrors”: Updike’s ‘At War with My Skin’ and the Difficulties of Inheritable Illnesses”). Also included are essays by James Plath (“In the Manner of Michelangelo: John Updike’s The Poorhouse Fair“), Peter J. Bailey (“‘Richard Had Forgotten Why’: Deflection and Sublimation in Updike’s Problems and Other Stories), Robert M. Luscher (“Changing Names and the Keys to Memory in Updike’s ‘Walter Briggs'”), and Donald J. Greiner (“John Updike, Ted Williams, and the Complexity of ‘Hub Fans Bid Kid Adieu'”). In the issue Judie Newman reviews John Updike Remembered by Jack De Bellis, Sue Norton reviews Writers and Their Mothers by Dale Salwak, and Michial Farmer reviews Understanding John Updike by Frederic Svoboda. The John Updike Review is published twice yearly by the University of Cincinnati and The John Updike Society, edited by James Schiff with help from managing editor Nicola Mason. Members of The John Updike Society automatically receive copies. Here is the membership link. For institutional subscriptions and single copies, email james.schiff@uc.edu. This entry was posted in The John Updike Review. Bookmark the permalink.